As you know, users of terrestrial GIS need no longer source, order and store spatial data. Instead, they access services online and ‘on demand’. Unfortunately, users of marine data have not been so well served. 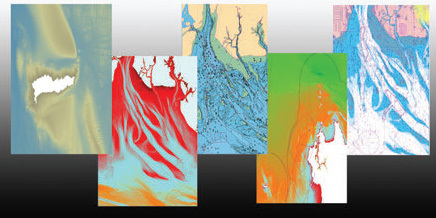 Applying advances in GIS to the marine environment have been hampered by the fact that data was frequently hard to source, often encoded and difficult to access for non-navigational purposes. It was also collected and maintained in different formats by departments which failed to communicate with one another and were bound by issues relating to national security and navigational safety. seamless Feature Layers overlaying Marine Themes DEM; raster chart. In recent years, however, initiatives driven by national and pan-national bodies have highlighted the need for marine date to be made more widely available and many leading hydrographic offices have responded positively…paving the way for the development of new WMS, WCS and WFS marine data feeds. The disparate nature of traditional marine data collection and its division into different categories (oceanic, coastal approach, ports and harbours) means that integrating this data into a uniform spatial layer presents considerable challenges. Compiling a scaled WMS feed of UKHO raster charts, for example, requires the compilation and de-confliction of hundreds of individual files. The exact display order must be carefully determined to develop a useable and cohesive map background. Similar de-confliction is also needed with vector data derived from an electronic version of the raster chart. Only once these issues are fully resolved is it possible to deliver consistent marine mapping data in a meaningful format. In order to create ‘on demand’ services it’s also necessary to address bandwidth issues, optimise data for efficient delivery, ensure that the server infrastructure is efficiently and robustly configured, and to offer secure access. Previously, many applications have compromised by offering a ‘halfway house’ between immediate data access, security and user operability. A true ‘on demand’ service offers immediacy, flexibility, efficiency and cost savings. The above blog was adapted from a longer article published in Nov/Dec 2012 Geoconnexion UK, by Jon Coleman, Marine & Environmental Business Manager at FIND and John Pepper, Marketing Director of OceanWise Ltd.